That is everything sorted and ready for CRC race for the 3rd month on the trot this Sunday at 10am. The weather l have heard is on our side. We will start at 10,but if everyone is there that is on the list, then we will start the first runner off before 10am. 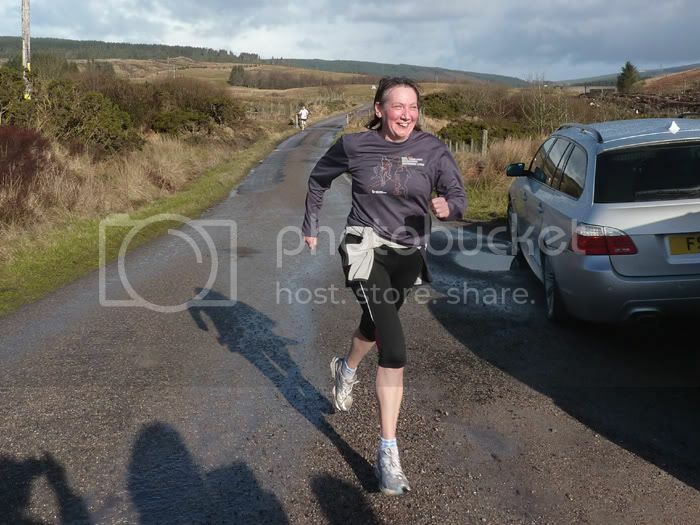 A crisp fast race every so often,is better than a plod in a park,as they say. Well done at training tonight,fine night for running it was. See you all plus the guests on Sunday. 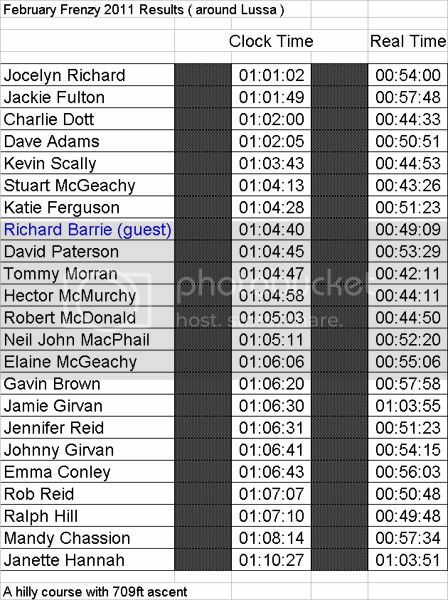 Everyone that ran today from CRC and our guest Richard, you were all a credit to yourselves and it was once again a pleasure to be part of it. The results have been sent to the clubs/forum web masters so hopefully when they have time they will put them up. Any discrepancies please pm or email me. Well done again All and thanks again Rab for your kind words as usual. Brilliant race, thanks DJD for yet again another well organised race! Beautiful morning for it and a great route. 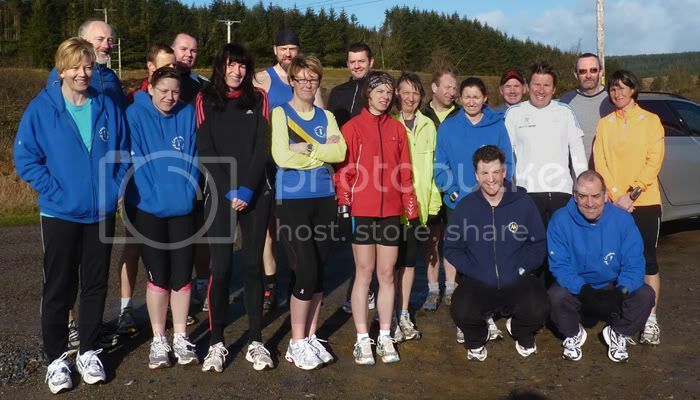 Times and photos will be on http://www.campbeltownrunningclub.com later tonight. Thanks to you all. Good to see the constant faces at the events. The debate still rages in my head about the best way to do that route for speed. Clockwise? Anti- clockwise? Its a great way to get up to race pace. I know now that I could easily PB a 10K on a flat route. Thanks for the soup Donald, wasn't expected but much appreciated. 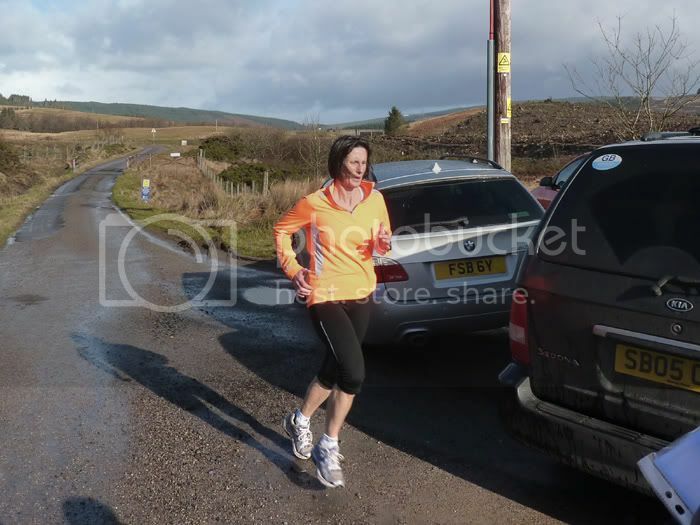 Respect to Elaine for her 18 miles yesterday and a good run today (don't burn yourself out!). Tina and I hope we will meet up with you again soon. Glad I went along today and was certainly a tough route. 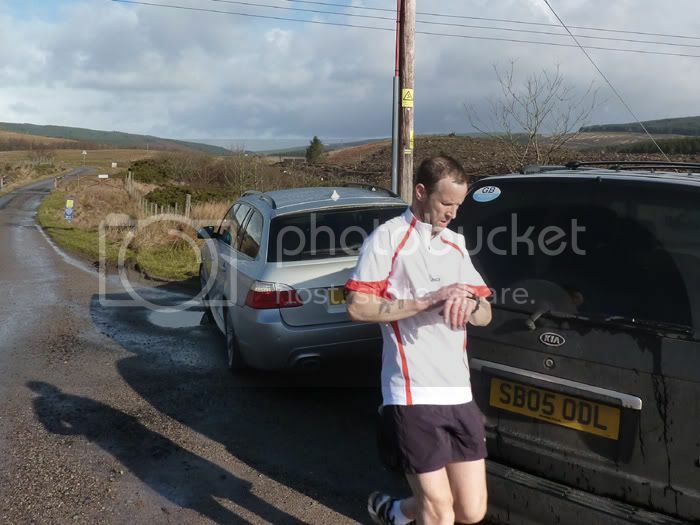 Having went up later in the afternoon and ran it clockwise I have to say anti-clockwise, as I ran in the race, IS far far harder! Well done to everyone again and great to see so many turn up. 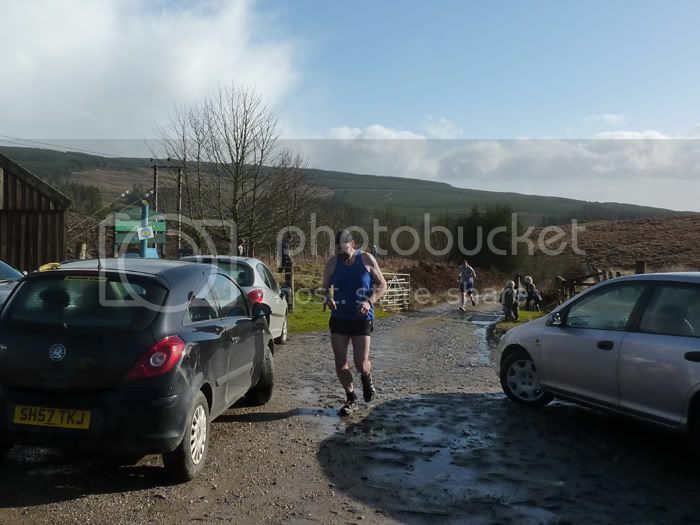 Results of the 2011 February Frenzy, Lussa Loch, 27th February 2011 - 6.48 miles with 709ft ascend. The wk after 10k/1/2m traing starts. The Frenzy was great yesterday. Good to see the numbers participating and the times coming down. Remember it was 6.5 miles, folks, not 6.2 (10K distance). Also that there was a 700 foot incline to take care of. Everyone is showing real improvement. Well done!! We are now starting to think towards the KWR in May. We could put on another club race for the end of March,but we think it would be more sensible to start to hit the Kintyre terrain. What we propose to do if we get a good response is to run the longest part of the relay,between Tayinloan/Carradale section a total of just over 15/16 miles, then we could have lunch together somewhere in Carradale, all will be dropped off in Campbeltown and it being Saturday people could still go out on the night for a shandy or two (lol)and not worry about the Sunday. We can and will do, break it up and have distances of approx 10m, 12m,and 15m,so it is available to all members to run and not just for the long distant runners. Our intention is to make it a club run and one can run it how they want. (Plenty of time for racing). The date would Saturday the 26th March 2011, and like we said, if enough people are up for it,we could hire one of the community buses, for pick ups and drop offs. (but we need a volunteer to drive). So on this blue print we have 4 so far.Please add your name over the next week or so. Last edited by DJD on Fri Mar 04, 2011 12:22 pm, edited 2 times in total. You can add my name Donald, please. Sounds great to me, looking forward to it although I know it will be a challenge! 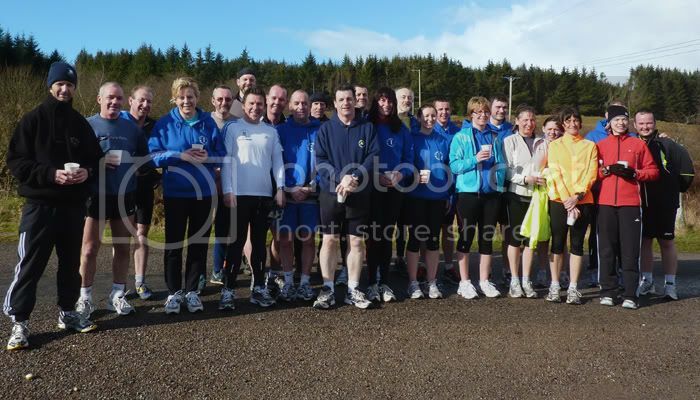 Campbeltown Running Club AGM will take place at on Friday 25th March in the Aqualibrium’s Conference Room (7 – 8pm) – all welcome. Please come along if you can to show your support and to voice your opinions on club matters. Just want to pop this up again that Campbeltown Running Clubs AGM meeting is for this Friday which has already been advertised in the previous post by Elaine. Even if you are not a member and are considering joining at anytime in the future, you are very welcome to come along and see and hear for yourself that club has progressed in it's short history and hear its aims for the coming year. We are always on the look out for new runners,so if you want to improve your running then joining a club is a great way to do just that. There is plenty, infact stacks of runners within the club that will guide you along the way and everyone encourages each other.More important there is something for everyone and one can express their running ability without being held back or feel out of sorts, group running at it's best. A Club is as good as it's members and believe me Campbeltowns is.